The winner of the 20th edition of the NTRA National Horseplayers Championship [NHC] three-day event at Treasure Island resort in Las Vegas was Scott Coles, an NHC rookie from Grayslake, Illinois, who took on the foreboding task of facing a field of the best and most experienced tournament players and emerged victorious to win the annual championship handicapping tournament that decides the Eclipse Award for Handicapper of the Year. Coles defeated a field of 668 entries to earn the grand prize of $800,000. The NHC, held on Feb. 8-10, 2019, pitted 530 individual horseplayers (138 players earned the maximum two entries allowed per person) against each other for a prize pool worth $2,316,000. Coles’ victory was a thrilling one as the leaderboard continually flip-flopped during the course of the final seven tournament races during “Final Table” action on Sunday afternoon. When the Final Table concept was first initiated six years ago, you have to think this year’s NHC finals was exactly what they had in mind as five players see-sawed atop the leaderboard with hundreds of thousands of dollars hanging in the balance. 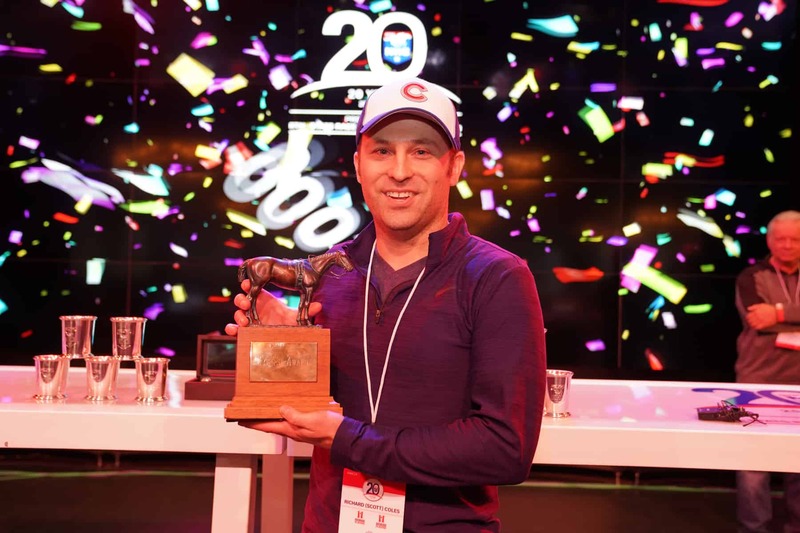 Coles, a 34-year-old futures trader, became the youngest-ever winner of the NHC crown. He was one of 118 NHC rookies in the field of NHC 20. Coles accumulated a contest-winning total of $367.00 based on the results of a total of 53 mandatory and optional $2 win-and-place wagers over the course of the three-day contest. His bankroll was enough to hold off runner-up finisher Jim Meeks with $356.60. Meeks earned second-prize money of $250,000. Third-place finisher Matthew Vagvolgyi also cashed for six-figures, earning $125,000 in prize money for finishing with a score of $354. All three of the top finishers benefitted from a winning longshot selection at Golden Gate on the penultimate race of the contest to leapfrog the leader at the time, handicapping tournament and Pick 6 legend J. Randy Gallo of Jupiter, Florida. Gallo had assumed the lead on the strength of a massive winning streak Saturday afternoon, and by adding more winners early at the Final Table. Gallo had no answer, however, for Coles’, Meeks’, and Vagvolgyi’s late Golden Gate longshot, and had to settle for fourth with a final bankroll of $337.40 to earn a $100,000 prize. Coles was an improbable NHC winner given his age and inexperience. He only began playing the races seven years ago and was not a serious horseplayer until getting hooked to the sport during American Pharoah’s Triple Crown year in 2015. “I started playing the [NHC] Tour at the very end of 2016 but didn’t qualify. Then tried last year on and off, but didn’t get there,” Coles said. “This year I was fortunate to get double qualified. Navigating through (the NHC) was interesting. There were a lot of nerve wracking moments. Among the players that Coles prevailed over was defending NHC champion Chris Littlemore, who made an amazing showing to finish seventh with $298.40. Littlemore became the highest-finishing defending champion in the 20-year history of the NHC and earned $58,500 in prize money. The remaining seats at the Final Table were filled by fifth-place finisher Steven Simonovich ($327.20 score to earn $75,000 in prize money), sixth-place finisher Joe Perry ($324.40, $65,000), eighth-place finisher and Day One leader Robert Gilbert ($297.40, $55,500), ninth-place finisher Marshall Gramm ($276.90, $52,000), and tenth-place finisher Frank Drew ($268.80, $50,000). Players made mythical-money wagers throughout the weekend on eight tracks including Aqueduct, Fair Grounds, Golden Gate, Gulfstream, Laurel, Oaklawn, Santa Anita, and Tampa Bay Downs. When all the weekend’s purse awards and prizes are considered, including 425,000 for the winners on the year-round NHC Tour, the total purse of the event totaled $2,863,000. This was the sixth year of the NHC’s “Final Table” contest format, which narrowed down the field from 668 entries on Friday and Saturday to the top 10 percent (67 players) who made the cut for Sunday morning’s action. Those 67 players were eventually pared down in Sunday morning’s semi-final round to the top 10, who all advanced the compete in the all-mandatory seven-race Final Table finals on Sunday afternoon. Players made 18 mythical $2 win-and-place bets on Day One (Friday) and Day Two (Saturday) of the NHC Final, and then as many as 17 more win-and-place bets on Day Three, including 10 optional morning plays in the semi-finals, and then seven more mandatory bets at “Final Table.” Payoffs on all days were capped at 20-1 ($42) to win, and 10-1 ($22) to place. All 67 players that advanced to the semi-final round earned a minimum of $4,000 prizes, with everyone in the top 37 earning at least $10,000. All players who didn’t make the cut played in a separate Consolation Tournament on Sunday morning for a $50,000, with $10,000 to the winner. “We are delighted to play host to many of the nation’s top horseplayers at the historic 20th NHC,” said NTRA COO Keith Chamblin. The NHC is a true celebration of the horseplayers – the individuals who fuel every aspect of the sport and the business of Thoroughbred racing. You can get involved in the NHC Tour for 2019 by simply going to www.NTRA.com and joining the NHC Tour. You can’t buy your way into the NHC. Players must qualify into the field with a win or high finish in one of the numerous NHC Tour on-site and online qualifying contests held year-round, or by amassing cumulative NHC Tour points in online and on-site handicapping events. In 2018, 34 racetracks, race books, contest websites, ADW wagering sites, and other organizations partnered with the NTRA to host qualifying contests. Coles had qualified for the NHC with two entries with high finishes on back-to-back weekends over the summer at Horseplayers.com. Coles’ final winning three-day point total of $367 was solid compared to other recent NHC winners. Littlemore scored $326.30 in 2018, while Ray Arsenault totaled $407.70 to win the finals of the 2017 NHC. The 2016 NHC winner, Paul Matties, finished with $399.50 in what was the first year of the current 53-race NHC Finals format. Matties, Arsenault, and Littlemore were all in the field for NHC 20, along with four other past champions including Jim Benes (2013), Michael Beychok (2012), Richard Goodall (2008) and Stanley Bavlish (2007). In addition to his $800,000, Coles also is the winner of the 2019 Eclipse Award as Handicapper of the Year, as well as an automatic berth into next year’s NHC 21 to defend his title.